Bypass is one of four OP state Flags present on every OP in a network. 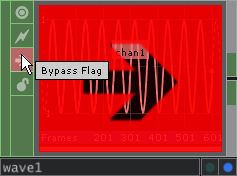 The flag indicates whether the OP affects the network. When an OP is bypassed, the network acts as if it were not there. Regardless of how many inputs an OP has, the first input is passed through. Another way to think about it - when bypassed, the network will cook the same as if this OP were deleted. 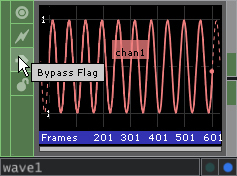 This flag is useful for testing to see what the network would do with an OP removed without having to do any rewiring. To bypass an OP, click on the arrow shaped flag. Clicking on it again removes the bypass. OPs that have been bypassed are easily identifiable by the large red arrow that is superimposed on the operator's viewer. This page was last edited on 5 October 2017, at 16:54.